Nearly a decade ago, Jemima Parry-Jones (JPJ), Director of the International Centre for Birds of Prey (ICBP) located in Newent, Gloucestershire, United Kingdom, answered an e-mail I sent to her hoping to gain insight on captive raptor management. Not only did JPJ promptly and thoroughly respond to my questions, she insisted that I visit her facility. With the generous support of Hawk Mountain Sanctuary friends Brian and Sandra Moroney, I completed my educational journey across the pond earlier this season to benefit our feathered educators and the volunteers and staff who work together to maintain best practices in raptor care management at Hawk Mountain. Education raptors help to connect learners of all ages to conservation with an up-close look at species that serve a vital role in our ecosytems worldwide. Jemima Parry-Jones and a barn owl welcom school children to ICBP. Located in the quaint English countryside, ICBP oversees nearly 300 birds of prey, including a diverse workforce of owls, eagles, vultures, kites, hawks, falcons, and harriers. During my stay, I was treated to a grand tour of the entire facility. Open to the public 7 days per week, 10 months of the year, visitors have the opportunity to see raptors on display in a zoo-like static setting and during multiple free-flighted training sessions throughout the day. During these flying demonstrations, ICBP trainers connect visitors of all ages to a fast-paced, exciting look at natural history in action. One highlight of my visit was participating in training several yellow-billed kites by cuing birds to fly over the field in front of visitors and signaling them to return, tossing meat straight up in the air to emulate their natural behavior of grasping prey in flight. Although I do not consider myself athletic, there’s nothing like being watched by countless visitors who are glued to your every move while one of the most famous falconers in the world is narrating and evaluating your meat throwing abilities. With the supportive direction of JPJ, I felt like an Olympian. An ICBP staff member monitors the weight of a white-tailed sea eagle. In addition to shadowing the husbandry and training of some of the world’s largest and endangered raptors, I learned new techniques and skills to improve communication through body language and clear cues when working with animal colleagues. While working with a massive white-tailed sea eagle, I honed my ability to remain perch-like to provide a stable and trustworthy roost. If you see me lifting weights, you’ll understand why I want to build and maintain a strong and stable resting place for a bird who weighs over ten pounds. Sadly, when visiting the on-site rehabilitation hospital building, I learned more about real-time conservation challenges like the direct persecution of raptors in the community. Unlike North America, migratory birds are not legally protected and are perceived as competition for resources such as small game. I had the opportunity to meet with law officials who were inspired by Hawk Mountain Sanctuary’s rich history thanks to pioneer conservationists like Richard Pough and our own founder, Mrs. Rosalie Edge. On this side of our shared Atlantic Ocean, I remain proud to represent the world’s very first refuge for birds of prey and to help advance our mission by sharing our story and the need for continued research and education worldwide. Help support our raptor care and public raptor education efforts by donating or becoming a member today. 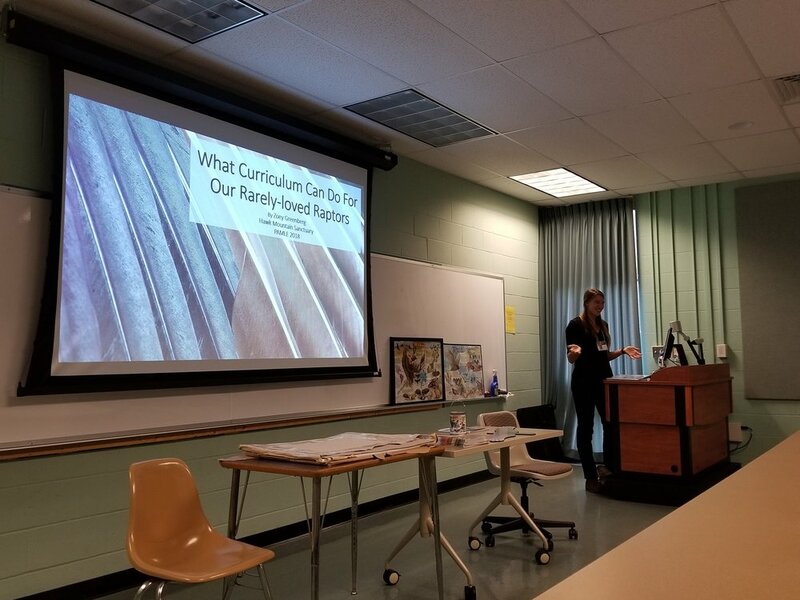 This October, HMS Director of Education Erin Brown and I presented at the 2nd annual conference for PAMLE, the Pennsylvania Association for Middle Level Education. The keynote speaker, Dave F. Brown, co-author of the book What Every Middle-School Teacher Should Know, started the day off with a potent analysis of how the average preteen views the world. 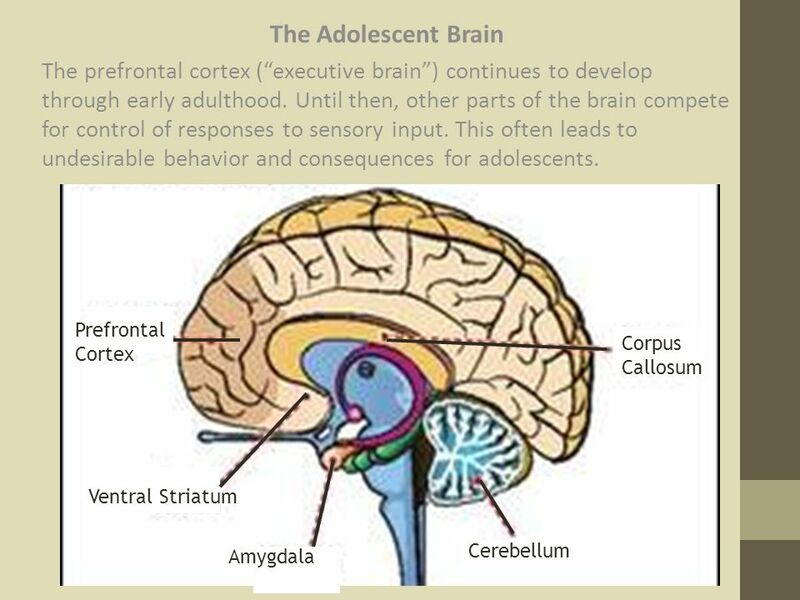 Incorporating neuroscience, he made a compelling case for increased compassion towards adolescents and the importance of cultivating supportive learning environments in middle school classrooms. Dr. Brown also highlighted the importance of identity development, reminding us that middle school students are discovering who they want to be and what they value. This point stuck with me for the remainder of the day. I tried to remember what it felt like to be a seventh grader and found myself in agreement: the first memories that resurfaced were of social belonging, and attempts to carve space for myself in an ocean of others. Towards the end of my own presentation at the conference, I received a comment from a teacher that drove my contemplations deeper. He told me he has many female science students who begin with enthusiasm but almost always fade away from science because they claim it’s associated with boys and technology. This got me thinking about ways in which informal education has a role in the presentation of science, not just as a career, but as an exploration of identity. Many of us would agree that science is largely defined by the scientific process, which includes inquisition and curiosity. Some, including myself, would say that passion is often an important catalyst for scientific discovery. Schools work hard to prepare students for their future, as they should. However, teachers face a plethora of challenges and deadlines that can sometimes limit their creative methodology when introducing an entire field of study. Science and technology have quickly become buzz words of the future; however, I would argue that the definition of science in this context is related heavily to human progress and less to other important avenues such as environmental protection or the classically termed “dying breeds” of natural history and zoology. Zoey working with students from the Swain School in Allentown, PA on the newly developed HMS Black Vulture curriculum. It is within this gap that I feel that Hawk Mountain plays a huge role. We create educational materials for the classroom that give teachers options for how to design their own framework of science. We align these lesson plans with standards, include the most up-to-date raptor science, and offer training to teachers whenever possible. In this way, I believe that we are paving a beautiful path towards an inclusive definition of the word “science” that can be offered to young students who may simply identify as lovers of wildlife but aren’t sure how to weave this piece of themselves into their academics. If Hawk Mountain staff had come into my 7th grade classroom and told me that there were real live adults that studied birds of prey for a living, my jaw would have hit the floor. Part of the reason I feel such pride in this organization is because we expose the young and the old to a breathtaking dimension of the natural world, and we put effort into reaching those that cannot make it to our site. I regretfully shied away from science in middle school, and I want to acknowledge the role that informal education can have in welcoming adolescents to a rewarding and impactful field. Raptors provide an intriguing route into the realm of science and Hawk Mountain is well equipped to assist teachers on the road to creative instruction. A vulture roost in Reading, PA, that Zoey observed during her time as an HMS conservation science trainee. Erin and I were the only non-formal presenters at this conference, and I was heartened to see that our presence was valued. I have immense respect for the consideration that attendees at this year’s PAMLE conference showed for their student’s well being, by assessing ways to enhance how we, as a community invested in youth, can encourage student growth. Our world is brimming with amazing teachers, and I feel optimistic that through partnership between informal and formal educators, innovative education has no limits. Trust me, even a turkey vulture roost can become a world of discovery with the right attitude and freedom to set the stage. Rachel and TRC’s Education Program Manager Gail Buhl work through passing off and handling a bald eagle. Earlier this season, I had the incredible opportunity to attend The University of Minnesota’s 2017 Care and Management of Captive Raptors four-day comprehensive workshop from October 13-20, funded by a Philadelphia Foundation grant. With over 20 years of “talons-on” experience working with raptors in captivity, I have returned to Hawk Mountain Sanctuary from The Raptor Center (TRC) with a renewed sense of empowerment and motivation to propel our captive management practices to a world class status. Prior to handling and training birds at the TRC, I successfully completed hands-on medical exams and necropsy under the direction of expert clinic staff. Although far from being Dr. Dolittle, after learning the best practices in diets, nutrition, equipment, and raptor housing, I am eager to implement modifications to provide the highest quality of life for my feathered coworkers. Rachel assists Hawk Mountain's veterinarian, Dr. Pello, during a routine check up of our red-morph eastern screech owl. Hawk Mountain Sanctuary’s Education Department is responsible for a collection of birds that require care and maintenance 365 days a year. In my role as senior educator and lead raptor care manager, I schedule, train, and supervise volunteers ensuring best practices and the safety of volunteers and birds. With the support of my education teammates Erin Brown and Adam Carter, I created a vetting process for volunteers to ensure consistency and high standards of care. Unable to send a text message or call staff when they are ill, we are responsible for feeding, cleaning, conducting routine health checks for the birds year-round. We take this responsibility seriously 24 hours a day, 7 days a week, monitoring bird welfare through polar vortex temperatures, mosquito-breeding season, and beyond. Attending the TRC workshop fostered my deeper appreciation for the role of avian educators as ambassadors for raptor conservation. We also manage on-going training and enrichment for both the birds and volunteers throughout their tenure, aiming to provide a stress-free environment for our avian educators throughout their lifespan. Although young at heart, several members of our avian education team are entering their “golden years” and have geriatric needs. The HMS avian educators have individual special needs in addition to the natural history requirements of each species. Rachel hones her raptor training skills with TRC’s resident red-tailed hawk. In recent years, I developed a Raptor Care Advisory Committee consisting of an avian veterinarian, raptor rehabilitator, and professional bird trainer who share their unique knowledge, specialized skills, and experience to meet the needs of our captive raptor management plan. With the guidance of the International Association of Avian Trainers and Educators (IAATE), I’ve created a collection plan, training and enrichment plans, and a retirement position statement to ensure consistency and adherence to our mission of serving as a model facility. Although the Pennsylvania Game Commission and the United States Fish and Wildlife Service require annual audits of Hawk Mountain Sanctuary’s collection of captive birds, we also undergo a yearly voluntary audit by an outside source. Most recently, my ultimate raptor conservation hero, (after Rosalie Edge, Maurice and Irma Broun, of course), Director of the International Centre for Birds of Prey, Jemima Parry-Jones conducted a thorough exam of all birds and an audit of our enclosures and indoor raptor care facilities. I owe a debt of gratitude to Hawk Mountain Sanctuary’s team of volunteers, advisors, staff, and mentors who continue to support me. When you visit the Sanctuary and enjoy a live raptor program, ‘Raptors Up Close’ or meet one of our ambassadors at a festival or large event, please know that your support makes a positive impact! The view outside the Pro Natura raptor banding station. My trip to Veracruz, Mexico to collaborate with Pro Natura, developing Distance Education materials, is one I will not forget. Ever since 2012 when I was a Hawk Mountain Conservation Science Trainee I heard so much about Veracruz and its amazing migration. Finally getting to go in-person as a Hawk Mountain staff member and witness first-hand was like a dream come true. Adam posing with students outside the Chichicaxtle Bird Observatory. A significant portion of my visit was spent at the Chichicaxtle Bird Observatory located just outside of Cardel, Mexico. Surrounded largely by sugar cane fields, this is one of the locations where the passage of migrating raptors and other species like anhingas, wood storks, and other water birds can number in the tens of thousands in a single day. During heavy flights there can be easily more than 100,000 migrants in a single day. At the observatory is where the Pro Natura staff and I had multiple discussions sharing our successes and challenges in conservation education. One of the specific topics we discussed was about a Distance Education trunk and its materials to stay in Mexico for use at the observatory and in surrounding classrooms. I was able to visit one of the local schools where such materials would be used. The students lit up when the Pro Natura staff entered their classroom, getting to handle a replica owl and hawk skull to compare and contrast. Hopefully in the near future, our collaboration can enhance these experiences with additional materials and activities. Hawkwatching from inside the raptor banding station outside of Chichicaxtle along the Carribean coast. One morning I was able to spend several hours at the Pro Natura raptor banding stations along the coast. Although we didn’t catch any birds, during the entire period I was there, a torrent of eastern kingbirds, ruby-throated hummingbirds, dickcissels, scissor-tailed flycatchers, and barn swallows poured through in a continuous stream as clusters of broad-winged hawks, mississippi kites, black and turkey vultures passed over head. It was here I felt the true enormity of migration and experienced the realization of how critical this corridor is for migrating birds. For me, it reinforced why we need awareness, education, and conservation of these species undertaking such incredible journeys across the hemispheres. You can help in supporting Distance Education efforts in Mexico, please donate at gofundme.com/raptor-trunk. Your donation will contribute to our final push to our campaign goal! Thank you so much for your support. During my time at Hawk Mountain Sanctuary, I realized that conservation was a science and has to be regarded so. Before then, I thought it was a love for the environment, turning off lights around the house or turning the tap off when I brushed my teeth. All these acts are important, and if everyone did them they could make a difference. However, as raptor biologists and conservationists, Dr. Keith Bildstein taught us that conservation is so much more. Conservation is not just an explosion of emotions, because emotions are personal and no one approach is a panacea. In Africa today, various ‘cultural’ practices have had a negative impact on raptors, particularly vultures. It seems as though culture is playing a part in the demise and extinction of our vultures. This is odd as culture has always been the driving force to safe guarding and conserving wildlife and forests for centuries. Going into this year’s vulture awareness month, I had the question of how culture has evolved so much in southern Africa into a monster that is wiping out vultures in their hundreds. In my culture, there is no fairy godmothers or tooth fairies, so when my teeth fell as a child, my mother took me outside and taught me a song. The song is to the Yellow-billed Kite Milvus aegyptius, an Intra-African migrant. What you do as a child, if you want your tooth to grow back is to sing the song that goes Mzwazwa! Mzwazwa! Thathi’zinyo lami ungiphe’lakho elihle! This directly translates to: "Yellow-billed Kite! Yellow-billed Kite! Take my tooth and give me your beautiful one!" This is weird since birds have no teeth, and this bird’s tooth is a yellow, curved, and razor sharp bill, which nobody would like growing on them. After singing the song, you are then supposed to throw the tooth over the roof for the Yellow-billed Kite to collect as it flies over your house. This small tradition in my corner of the world makes the bird so important, because children everywhere want the safety of the bird as it brings their adult teeth, and parents everywhere want that moment my mother shared with me so many years ago, passing along the tradition. My second annual International Vulture Awareness Day seminar at the Natural History Museum of Zimbabwe for this year was themed Vulture Conservation and Culture in Zimbabwe. My intention was for scientists, the general public, and culture experts to talk about vulture conservation issues and what needs to change in Zimbabwe for their protection. I invited the BirdLife Zimbabwe Conservation officer for Special Species Ms. Fadzai Matsvimbo, Zimbabwe Parks and Wildlife Authority (ZimParks) senior ecologist Ms. Lovelater Sebele, and renowned author, historian, and culture expert Mr. Pathisa Nyathi. We had a great turn out of people from all over the city that knew close to nothing about vultures but were intrigued and interested in getting to know about them. The two speakers from BirdLife Zimbabwe and ZimParks illustrated the current status of vultures in Zimbabwe and what conservation efforts are happening on the ground. BirdLife Zimbabwe works closely with ZimParks in Hwange National Park and has reported on various vulture poisonings around Zimbabwe. In Hwange Park, cyanide poisoning on salt leaks in elephant poaching is the main cause of mass deaths of vultures and many other scavenging animals; however, in other parks like Gonarezhou on the boarder of Zimbabwe and Mozambique, Aldicarb a carbamate insecticide is the most common, along with the harvesting of body parts for muti (traditional medicine). The major problems faced by organizations like these two are the lack of understanding of the value of vultures and inconsistencies in the litigation process. The judiciary system is failing our vultures, delivered sentences are inconsistent, and often vultures are not included as part of the cases. There is a lack of awareness in game rangers working in the parks, where vulture losses are not properly documented. For these and many other reasons, the two organizations have partnered in educating rangers on identification, data collection on poaching crime scenes, and conservation status. Our historian and culture expert explained the African philosophy on conservation, and he reminded us that African communities were the best conservationists of natural resources whilst being utilitarian at the same time. African conservation is linked to cosmology and African spirituality, the belief that the earth is our mother and provider—that all matter has life in it, and in order for there to be life there has to be death. This spiritual approach to nature and the world, compared to the scientific, modern approach instills in all Africans a reverence to nature that inspires conservationists. Due to the philosophy that all matter possesses life, all the parts of an animal carry spiritual characteristics of the animal, and for this reason, vulture bones, beaks, feathers, talons, and even meat are used as muti. Originally, because of the ability of vultures to ‘miraculously’ tell where carcasses are, it was only used by traditional healers for divination as part of their wardrobe. The use of vulture body parts for muti has only recently spiraled out of control due to increased possibilities for foretelling with sports betting, gambling,business successes, and investment results among others. The biggest take home for all that night, especially for the conservation scientists, was that no external policing is more effective than internal conviction. This means that African children today need to be taught about African philosophy and spirituality to regain that awareness of wildlife. Along with western, scientific, material/physical education, African spirituality also needs to be taught to younger generations as it is being lost in current generations. The scientists were also urged to educate the public of the world view and wildlife understanding through indigenous African knowledge systems and to remain respectful of local people’s beliefs; perceptions are real, just as their consequences are. In the end, I learned the value of my culture in conservation and how to be a holistic and effective advocate for conservation in my country. Most importantly, I realized the value of one day teaching my children the Yellow-billed Kite song and sharing with them the folklore that made me love and respect nature in my life and my career. Merlyn with African white-backed vulture. Photo by Julia Wheeler. Who was the most influential teacher in your life? In my experience it was my high school English teacher, Mr. Kranz. I was always captivated by his passion for theater and music, and his ability to provide me inspiration in a subject area I typically didn’t care for. I am currently in the last stage of completing my teaching certificate, student teaching at a challenging high school, and it has been a bumpy ride. The daily chaos and mayhem I have had to face as a naive student-teacher has proven to be taxing on my sanity at times. What has kept me motivated has been the moments in which I’ve had the opportunity to inspire students in the same way my English teacher in high school had inspired me. One of these moments occurred recently when I was invited to teach a lesson on birds and what it means to be a bird scientist for a 7th grade class at Long Valley Middle School. I began the lesson providing an introduction as to what ornithology entails, and more specifically, what a raptor is. I loved having a simple discussion with these bright 7th graders about the characteristics that make birds-of-prey different from songbirds. Borrowing materials such as talons, skulls, and wings, from Hawk Mountain’s education department, majorly enhanced my lesson. We were even able to look at Great Horned Owl and Red-tailed Hawk feathers under a digital microscope to observe the differences! To inspire and engage my students, I wanted them to get the experience of what it means to actually be an ornithologist. Using my own experience as a scientist conducting nest observations in real life, I designed an activity to allow students to conduct nest observations using a computer. Using YouTube, I found a video of a Great Horned Owl nest camera. Then, I created a “Field Notes” worksheet for students to complete as they watched the video. They took observations on the sights and sounds, they drew a picture, they described the habitat, and they took behavioral observations. I was so excited about how engaged in the activity every student was. At the end of the lesson, students got time to share their drawings and their observations on the board. I loved watching how excited they were to share their thoughts and their artistic abilities with the class. Fast forward to my Monday-morning reality: after a fleeting stint with a utopian 7th grade classroom, I am re-immersing myself in my intimidating high school classroom. However, I have gained a new perspective, and have developed new motivation to share how much I love science with my students. High school biology class should not be about fulfilling science standards or preparing students for standardized tests; it should be about exploring current scientific research and learning about the natural environment around us. I believe my time spent as an education intern at Hawk Mountain opened my eyes to this style of teaching. I plan to continue tackling the teaching challenges I am faced with daily with this in mind. 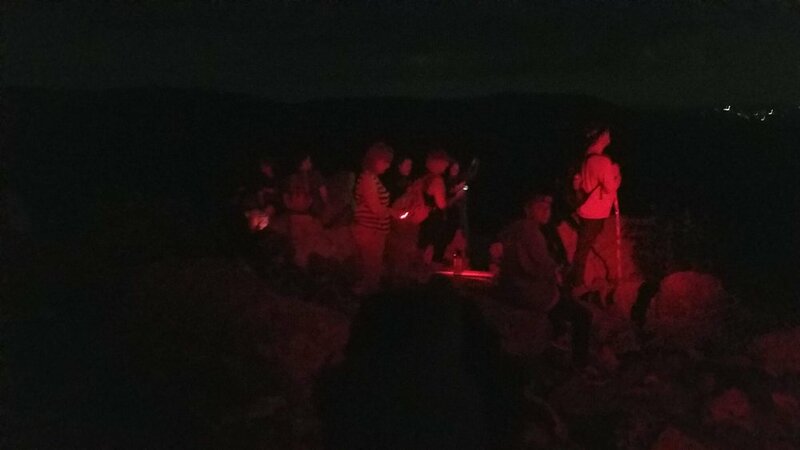 Learn more about Kirsten Fuller's successful work with the creation of Hawk Mountain's new technology-interactive broadwing curriculum, using Hawk Mountain tracking data, by checking out the Teacher Feature on the New Jersey Science Teachers Association website! Hawk Mountain educator Adam Carter presenting a live raptor program at the Pottstown Public Library, featuring a red-morph eastern screech owl. Hawk Mountain Sanctuary, known worldwide for its revolutionary work on raptor conservation, also uses living education raptors to help inspire and teach others about birds of prey. If you’ve ever wondered how important the jobs of the birds that live at Hawk Mountain Sanctuary are, the answer is as easy as watching the countenance of a young audience when one of our educators introduce our “feathered co-workers.” The majestic animals captivate pupils of all ages and provide that essential connection between the wilderness of the outdoors and our own humanity. This connection is sometimes grievously missing from the current discussions surrounding climate change and public health, and the world is in need of people who can restore it. The education raptors at Hawk Mountain were once wild birds that were severely injured and rehabilitated at a wildlife rehab center – given a second chance at life. In most cases, wildlife rehab centers are able to release the birds after they are sufficiently functional, however, there are some cases where raptors are deemed unreleasable. This is how education raptors come to be. The question is, who is responsible for diagnosing, treating, and prescribing medicine to the injured animals both while they are in rehabilitation or while they remain in captivity to be used for education animals? I don’t think many people realize that veterinarians specializing in exotics and wildlife are needed to help care for animals like these and others in captivity all over the world. The truth is, veterinarians specializing in treating animals other than the traditionally domesticated are vital to conservation efforts worldwide. Not only do wildlife veterinarians work to conserve global biodiversity through the lenses of medicine and animal health, but they also help contribute positively to the one health initiative that many conservation scientists have taken. This initiative usually is defined by understanding the inextricable connection between human health and animal health which hangs in a delicate balance. The spread of disease, environmental toxicity, and even natural disasters are some examples of this connection. 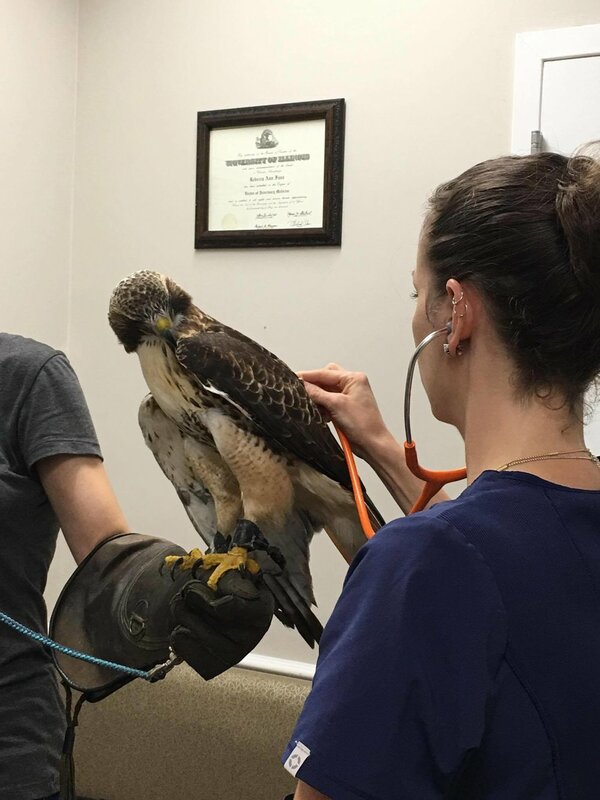 Dr. Susan Pello of Mt Laurel Animal Hospital gives Hawk Mountain's red-tailed hawk a yearly checkup. During my time as an education intern at Hawk Mountain Sanctuary, I was able to achieve a clear vision of my future as a wildlife and exotic veterinarian. Hawk Mountain provided me with the chance to watch this career in action, and I made connections with professionals in the field that I will be able to continually draw from for the rest of my career. I had the opportunity to watch a wildlife veterinarian examine and vaccinate all four of the sanctuary’s education raptors. Hawk Mountain’s veterinarian, Dr. Susan Pello, welcomed me to her clinic again soon afterwards where I watched her diagnose and treat an eastern screech owl with a severe eye infection. Dr. Pello and many other wildlife veterinarians work both at a traditional veterinary clinic and with potential wildlife cases. The future prospects of this career pathway is broadening as we enter an age in which humans are having increasing impact on the general environment and global biodiversity. As people realize that protecting wildlife is a social responsibility both locally and globally, veterinarians will need to step up and offer their specific medical expertise. When I attended the Jemima Parry-Jones vulture conservation lecture in early September, I found that veterinarians with experience in raptor medicine, nutrition, and captive breeding are desperately needed globally. In Southeast Asia, vultures are commonly poisoned by diclofenac-NSAIDS given to cattle, and their populations are declining rapidly. Electrocution and collision with poerlines are other causes of injury. The ecological role of vultures in such an environment is imperatively bound to the health and wellbeing of the humans that share the land. Vultures are a natural management system for carcasses that can become vectors for disease, bacteria, and other harmful or even deadly microorganisms. As animals continue to die from the shocking changes in climate and weather on a global scale, the ecological need for vultures could potentially increase where we are instead seeing degradation in natural populations. In captive breeding efforts, veterinarians trained to recognize the health of both the young and adults are needed in order for there to be successful results. Many of the offspring produced in the captive breeding programs suffer from vitamin deficiencies resulting in a dire need for individuals who are well-versed in raptor nutrition and health. Although this branch of veterinary medicine is still in the midst of developing, it is easy to predict where its future is heading. Not only can veterinarians help animals in the field for ecological and biological research, but they can also aid in the overwhelming need for general education that we hope will create the behavioral changes necessary to minimize the negative impacts of human beings on natural populations of animals such as birds of prey. I am a firm believer that getting the opportunity to connect with an animal face-to-face can affect your own personal daily decisions that make an environmental difference when broadened in the lens of the over-all human population. Many of the potential solutions to issues in conservation come from a pool that reaches many different bodies of expertise. We cannot simply expect our problems to be solved without the contribution of the knowledgeable and their efforts. Veterinary medicine is just one facet to the mosaic of the one-health initiative that ultimately aspires to nurture the ecological balance between humans and animals globally. Rebekah atop South Lookout, viewing the horizon. What would a perfect day at Hawk Mountain Sanctuary look like to you? Like a page out of “Goldilocks and the Three Bears,” the outside temperature on the ridgetop was not too hot and not too cold. The humidity was not too high, not too low, the breeze was not too strong, not too weak. You know the story –the conditions for an educational adventure were just right. Prior to the arrival of my group, I took a sound survey by simply closing my eyes and listening to the environment. Shortly after hearing the sound of a vehicle engine approaching, I welcomed a group of folks from the Vision Resource Center of Berks County, who were accompanied by a handsome and well-trained guide dog named Winston. We took a seat on the carpeted benches next to the bird feeder station just a few footsteps through the Visitor Center’s front doors. I gazed at the larger-than-life mural of our founder, Mrs. Rosalie Edge, as I introduced Hawk Mountain as a Sanctuary, a protected place for all animals, plants, rocks, sticks, and even spiders. I aimed to provide an extra safe place for my group, many who were visiting Hawk Mountain Sanctuary for the very first time, and some who had permanent vision loss. To complement our discussion on raptors and help visualize the amazing animal diversity found in the Appalachian Forest, I passed around feathers, snake skins, turtle shells, and the tail of a gray squirrel, while I introduced my avian coworker to the group. Although we do not allow or encourage touching raptors, as the live bird stood on my gloved hand, I passed around a life-size plastic replica of an eastern screech owl (Megascops asio). We also felt real raptor talons and compared a feathered foot of a great horned owl (Bubo virginianus) in contrast to the smooth, scaly toes of a red-tailed hawk (Buteo jamaicensis). With the aid of real raptor wings, we listened to the noisy wing of a diurnal hawk and felt a gust of air against our cheeks. In contrast, we struggled to hear the near silent flap of an owl’s wing and agreed that these amazing nocturnal adaptations allow owls hunt with the element of surprise. In addition to the owls’ adaptation of being silent flyers, we discussed the art of camouflage and how this adaptation helps many animals blend into an environment. Our group embraced our inner facial disk by listening to several songs of common birds like the eastern towhee and black-capped chickadee with the aid of Audubon bird toys and my very own rendition of a “miniature horse and trill” of an eastern screech owl, which seemed to evoke a soft whimper from the otherwise silent guide dog Winston. I even revealed one of Hollywood’s secrets: bald eagles are actually lip synching to the impressive screams of Red-tailed Hawks when filmed in movies and television. Several folks recognized this familiar call. Walking outdoors, we encountered a pollinator party—bees buzzing and hummingbirds humming. Okay, they don’t actually hum. The sound of those tiny wings beating is what generates the humming noise that we could hear from the thick patches of bee balm located just in front of the Visitor Center. In the Native Plant Garden, many folks commented on the warmth of the sun and fragrant aroma of blooming swamp rose. I also couldn’t pass up an opportunity to highlight Turkey Vultures as raptors who sniff out their meals with their incredible olfactory sense. We agreed to leave the smell of fresh baked bread and cookies to us and let the Turkey Vultures remain nature’s garbage collectors, cleaning up road kill. As we explored the pond from the deck, we listened for frogs calling and heard turtles leaving their exposed log perches for the safety of thick patches of water lilies. We enjoyed birds singing from all layers of the forest—delicate warblers hopping after insects in the canopy, catbirds curiously watching us from nearby branches, and the familiar sounds of robins foraging through the leaf litter. Crossing Hawk Mountain Road was also a new experience for most of these folks. We navigated the crosswalk by listening for on-coming traffic, and I provided a grateful thumbs up and smile to those drivers who slowed down. We took the Silhouette Trail one step at a time, taking advantage of the opportunity to rest at the benches before reaching our destination at South Lookout. As Winston led the way, he sniffed his way past Mountain Laurels and Rhododendroa to the flat, open area looking down toward the Kempton Valley. Once again my star students could tell they were in an open area since the sun warmed our faces and the soft, gentle breeze rocked the nearby trees. 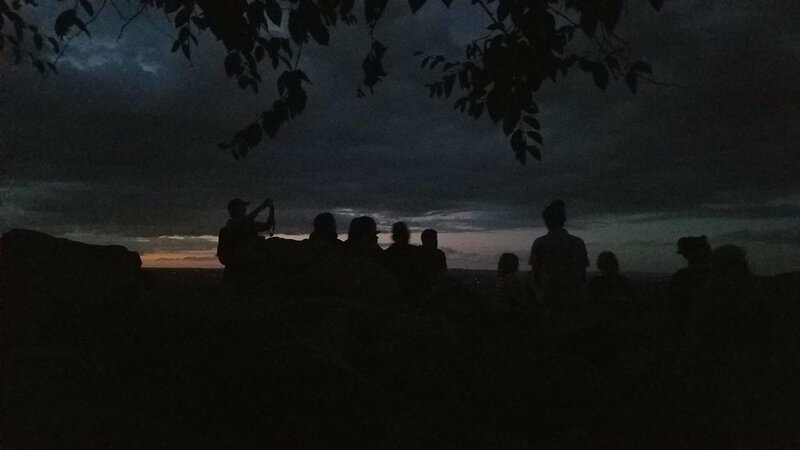 Although not everyone could see the view, we all felt the magic of this very special place, the birthplace of raptor conservation.